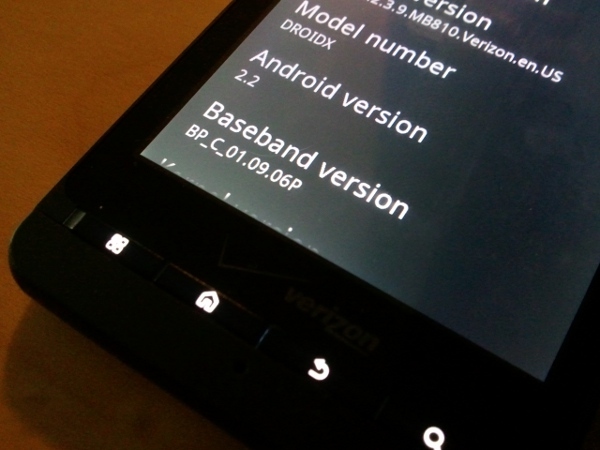 Rumor: DROID X Android 2.2 Update Launching 9/22? We know that Verizon and Motorola have stood by a “late summer” release timeline which if we’re getting really technical, would mean they have 2-3 days left to drop this on us. What we also know is that the Droid X on 2.1 has some major exchange issues which caused Motorola to hook up DX business users with Touchdown licenses to pass the time until Android 2.2 is released. When you put these 2 together, this is where we get interested. One of our readers, needing Touchdown, had to call Motorola after not receiving his free license. He was then told that Moto is out of Touchdown licenses and they are waiting until after the 2.2 update hits before they plan on replenishing license stock. And when did he expect the update to hit? September 22nd. The last day of summer. Two days from now. Again, a rumor from tech support, so take it for what it’s worth. Rather than crossing fingers, let’s cross shoe strings or something?